Does God see the Future? There is not a single verse in the Bible that could have been understood scientifically during the age when it was written. Our scientific mindset is a serious obstacle to understanding earth history the way the ancients did. All ancient people accepted fundamental change: that everything in the physical world is changing. They thought nature changes in a balanced way much as we change relationally as we age. Their concept of change is not compatible with the modern assumption that the properties of matter are fixed. Job 14 is an example of how the ancients understood Earth history. Job says man who is born of woman is of few days. Then he goes about listing the geological events associated with those few days. Ancient people accepted that the first generations lived for eons in few days. Jacob even stated that his days and years are shorter and worse than those from his fathers. One of Job’s geological markers for the length of those few days was the sea dried. In Hebrew the sea is called west. Job lived after the flood, around the time of Abraham, during the dinosaur age, near the Jordan river, east of the Mediterranean sea. In 1970 the drill ship, Glomar Challenger, extracted numerous bottom cores from several kilometers under the present surface of the Mediterranean. They found layers of deep-sea oozes alternating with gypsum, anhydrite, rock salt and algal stromatolites. In some areas the salt in deep basins is more than a thousand meters thick. Evidently the Mediterranean dried repeatedly and refilled through Gibraltar. A drowned waterfall and deep channel flowing out towards Italy reveal how the Med. refilled from the young Atlantic. Modern estimates for when the last time the Med. dried are about 5,000,000 years ago. According to biblical genealogies, Job lived after the flood, about 4,500 years ago. How could Job have known the Med dried, unless he saw it? We had no idea until we brought up the cores. This map is from NOAA show the relative ages of the seafloor. The oldest seafloor is purple and the youngest red. The eastern Mediterranean (west of where Job lived) is the oldest sea, formed before the Atlantic, Indian, Pacific and Arctic seas. Remember Peleg, who lived after the flood. 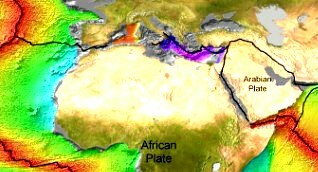 In his days was the earth divided palag by a watery division (Genesis 10:25). Job lists other evidences for geological happenings in few days. He mentions water washing away the dust of the earth and wearing away rocks. In the 1960′s the Russians constructed the Aswan High Dam at the first cataract (rapids) on the Nile, 1000 kilometers from the sea. A Russian engineer, Chumakov, drilled 15 holes in the river bed to find bedrock. The Russians discovered a sediment filled canyon 290 meters (950 feet) deep. At its lowest part, the canyon had almost vertical walls cut through granite. The dam is 110 meters above sea level, so the ancient river bed is about 500 feet lower than the modern sea level. The canyon sediments in the bottom 150 meters (500 feet) contained saltwater fossils. Apparently at some point the Mediterranean filled to its present level so that saltwater reached up to the first cataract. Only after the canyon silted to the present sea level did the sediments contain fresh water fossils. Drill cores at Cairo show that the Nile canyon was 2500 meters (1.5 miles) deep. This ancient canyon was deeper than the Grand Canyon but it is completely filled with sediments today. The Frenchman, Bourcart, examined steep submarine canyons that extend out from modern day rivers around the Mediterranean out into the depth. The bottom of these canyons contained gravel that forms in fast flowing streams. Apparently the ancient rivers cut down to a much lower Mediterranean and the ancient rivers were drowned when the Mediterranean refilled. Job ended his poem on the brevity of life by claiming their faces changed (shanah paniym – can mean faces doubled) before they died. We find the skulls of our ancestors with huge thick brows. The bones of the skull are the only part of our skeleton that keeps growing as we age. If we lived for geological ages our skulls would grow Neanderthal brows. However, our grandchildren would not have the thick brows. Neanderthal child skulls look more like us than the old ones with the bad teeth. 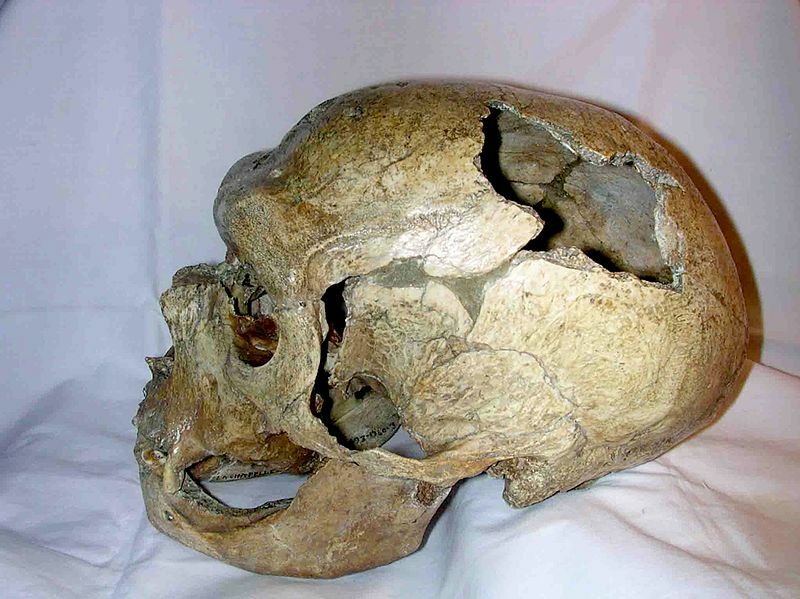 This La Chapelle Neanderthal skull photo was published in the Public Library of Science journal under the Creative Commons Attribution 2.5 license. The most powerful evidence for a literal (rather than a scientific) understanding of earth history is the visible history of how the galaxies formed. He created the plural heavens first, but at that stage the earth had no form, it was not extended in space although it had a surface, paniym. Then Elohim’s wind dithered in unbroken continuity as He continued to command light to continue to be. Matter and light are intimately related. In fact the space matter takes up comes from light that dithers around in all atoms. Today we have powerful telescopes that reveal cosmic history back to the creation age. We see that many ancient galaxies were compact, tohu wa bohu, without starry arms. We see, at many ranges, how the stars continue to form from the formless matter God created first. We observe how star globs came out and spread out as billions of galaxies grew into huge, local growth spirals. We even see the simple evidence for a biblical geology, that the Earth spreads out in unbroken continuity. The continents only fit together on a tiny globe without major seas and a global expansion seam keeps on forming new sea floor exactly as one would expect from the Bible. The Bible states that the Earth continues to spread out above the waters. The Bible is unscientific, supported by simple evidence, not complex, assumption dependent mathematics. The gif of the growing Earth is from Michael Netzer who permits its publication with attribution. The most powerful evidence for creation is seeing it without being blinded by mathematical theories. We should accept the simple evidence simply, as our ancestors did. The impediment to believing the Bible literally is a little idea invented by some monks ~ 700 years ago: that all things remain the same. Western empirical science, its definitions, measuring schemes and mathematical methods were contrived on the assumption that the essence of substance is changeless. Did Animals Die before Adam Sinned?